Rationalist Judaism: I've Renounced Rationalism! That's it! I've become convinced that I was wrong all along. 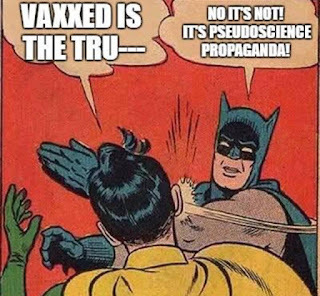 Especially on that Western medicine thing. Time for a career change! I've decided to become a witch doctor. I'm not American, but I thought that's only when you dress up as an African-American stereotype, not as an actual African? I agree about the blackface - even though it's American history, it can still strike people as offensive. Blackface is always a no-no. American or not. Can you do shapeshifting? The amaleki sheep were meant to be killed because the amaleki were turning into sheep to hide. She meets her parents at the airport with her new boyfriend: he's 8 feet tall with a bone through his nose, a spear and a shield. Her father approaches her, tears in his eyes. "Sweetie,we said a rich doctor, a RICH doctor." Grear shtreimel but I.m not crazy about the bekesha. I was equally aghast when I saw the black face. Your youngest son looks absolutely thrilled with his costume choice! Did he want to be a Charedi Santa instead? 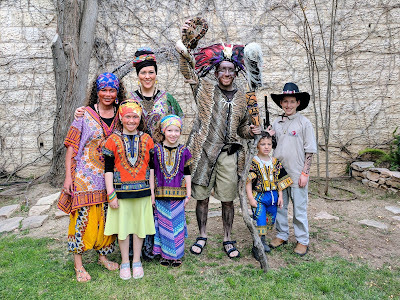 In the current climate of political correctness in the US (at least), it is considered insensitive/offensive/unacceptable to dress up as effectively any manifestation of a minority race/ethnicity, especially if it involves painting one's face brown/black. In fact, just dressing up in African (or African-appearing) garb is commonly considered off-limits these days on the grounds of so-called "cultural appropriation". Yeah, and what's with the sensitivity over white sheets and burning crosses. Modern sensitivities are crazy. We never had any problem with this back in the fifties. As Trent Lott said: "When [segregationist] Strom Thurmond ran for president, we voted for him. We're proud of it. And if the rest of the country had followed our lead, we wouldn't have had all these problems over the years, either." Let's go back to the good old days. Wow, such super sensitive types. Since when does brown paint count as blackface? And since when does dressing up as an African native count as insulting American blacks? Please. As a side note: I grew up watching old black and white movies, several of which featured blackface routin4es. As a kid, these routines always struck me as slightly weird. It didn't occur to me, though, that they were offensive, and I only learned that they officially were in my late teenage years. All that aside, though, Rabbi Slifkin is not wearing blackface! Watch an old film if you don't believe me. And it's nice to take a break from rationalism now and then! Hope you had a great Purim! Your family looks wonderful! To all the snowflakes out there, let me at least point out that all of these sensitivities simply don't exist in Israel. People dress up in stereotypes far worse than this and don't mean any harm by it, and no one's offended. Thank God this country isn't as crazy as the US in some ways. I saw this headline today (3/14) and my first thought was: well of course - everyone embraces irrationality on Pi day! Snowflakes abound. We need some Global Warming. The blackface (if that's what you want to call it) is harmless. No undue hatred was intended. What exactly is wrong with you and your family that you think this is appropriate? Shame on the lot of you. It's Purim! (or it was then). Can't you give the man a break? “His costume choice and subsequent response demonstrate an utter lack of sensitivity. Stereotypes are dangerous and offensive. Stereotypes dehumanize— removing individuality and promoting intolerance,” the group added." First of all, I'm sorry if anyone is offended. 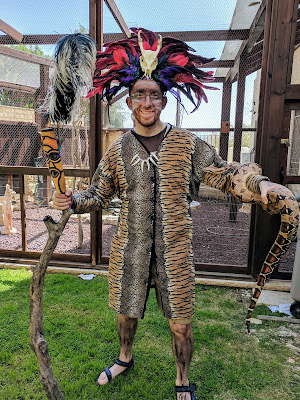 I live in a country where, on Purim, people dress up as people from different cultures. Native Americans, sumo wrestlers, Scotsmen, sikhs. Secular Jews dress up as Hassidic Jews and Hassidic Jews dress up as secular Jews. I have no problem (and nor, I think does anyone else here) with a non-Jew dressing up as a religious Jew, complete with stereotypical hat and beard. The problem with the hook nose and frugality song is that those are false and defamatory. It's not just a stereotype - it's a negative stereotype. 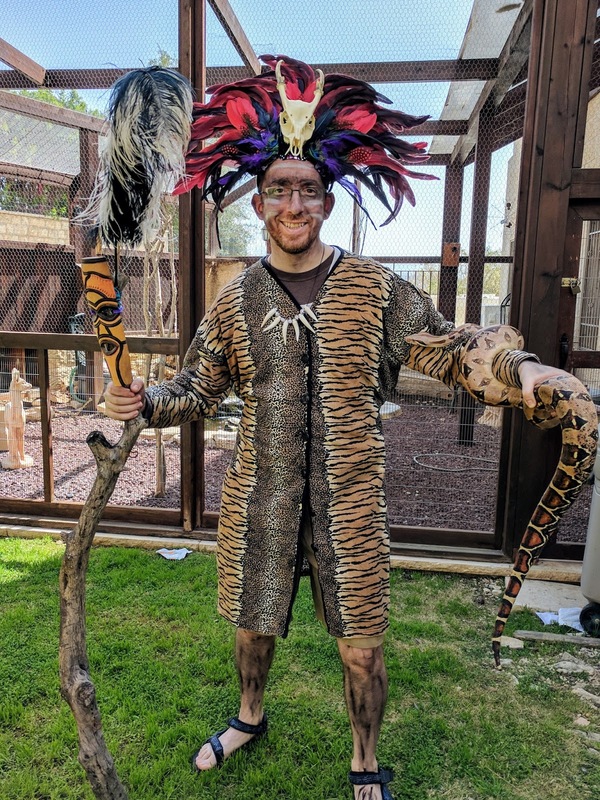 I dressed up as an African witch doctor. I have met African witch doctors, and that is how they look. There is nothing false or defamatory. If I am mistaken, please explain how! You are not mistaken. I think it's a great choice. The argument that Jonny Depp as Tonto was racist is that for many people, he is THE representative of Native Americans, and Native Americans are a lot more than just mystic animal-communers. But I wasn't representing "Africans." There are plenty of Africans in my city! I was representing a particular *type* of African - a person from a specific culture with a specific job. What's wrong with that? To heck with your "reasonable arguments", R' Slifkin! Were you in America, you would have been crucified by progressive types for this flagrant breach of their inviolable code of PC, "social justice" (the de rigeur buzzword-du-jour) etiquette. Please. Don't do that. The only thing that is offensive is what you're saying about him. So, I'm coming to this post weeks later than everybody else. But, I am perplexed. People accuse R' Slifkin of doing "blackface"...but his face is not painted black! Look closely at the picture! He has a black band around his eyes (vaguely resembling a painted lone ranger mask) and some white stripes. His face looks a little darker than usual, for some reason, but that's it. It's not "blackface" at all!